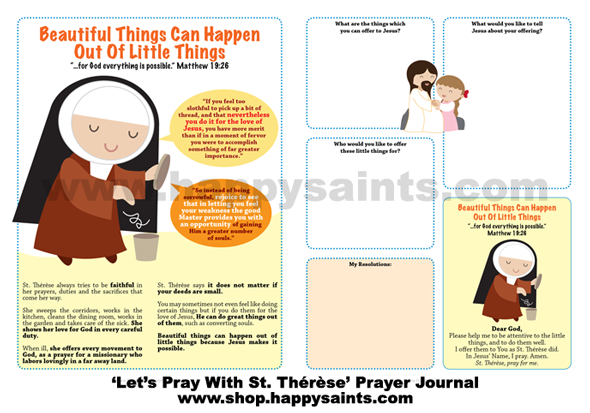 Happy Saints ‘Let’s Pray With St. Thérèse’ is an illustrated prayer journal featuring the ‘Little Way’ of St. Thérèse of Lisieux. It uses St. Thérèse’s wisdom to encourage the young and young-at-heart to explore their unique relationship with God. 17 chapters, each with a theme based on St. Thérèse sayings and accompanied by reflection passages, prayer cards, question-answer sheets and cute artworks!